CHOCOFUN is the latest chocolate powdered drink product from PT. Morinaga Kino, a FMCG company in Indonesia. CHOCOFUN proposition is for fatigue or stress from doing a common or even tight daily activities for kids and teenagers. They know, both kids and teenagers are the most Internet users, currently in Indonesia. So, for their product launch, they want it ?big? in digital. And to find the answer, they decided to take Next Digital Indonesia as a part of his team. As partner, CHOCOFUN and Next Digital Indonesia hand in hand in order to create a great and implementable concept. After many discussion, we give a suggestion to bring up CHOCOFUN ?FUN? sensation into digital campaign which is relevant to the interest of kids and teenagers today. 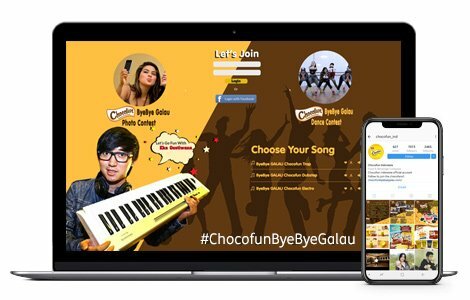 On the creative side, we begin to make a unique concept for digital campaign called ?Chocofun Bye Bye Galau? which inviting kids and teenagers to join the dance and photo competition with their product in hand, and upload it into digital by using a premium microsite that we created before, and their own social media. We believe, this way can cause a snowball effect for a good launching. This snowball effect has going roll bigger and bigger, when we also created a jingle music and using buzzer to represent teenager?s fun and spirit through this campaign. To make sure this snowball right on track, we put some creative hashtag as a video or photo uploaded requirement, along with CHOCOFUN social media maintenance. And to speed up, we make an eye catching artwork and place it into entire digital ads such as GDN, FB ads, IG Ads, youtube ads, and mobile apps ads.